Some days you simply cannot get away from work when you would like to and that means you get home later than usual. The time you have and, to be frank, the inclination to spend time you do have cooking a real meal can be much less than usual. At times like that there can be a great temptation to reach for the fast food. I admit, I had an inkling I would be delayed today so I shopped for the main ingredients at the weekend but this is in no way a complex recipe. I had bought a 500g side of salmon and a single bulb of fennel. I had store cupboard lemons, olive and coconut oil, herb dill and salad from the garden. First off I seared the salmon in coconut oil in the same pan that I was going to cook the fennel. 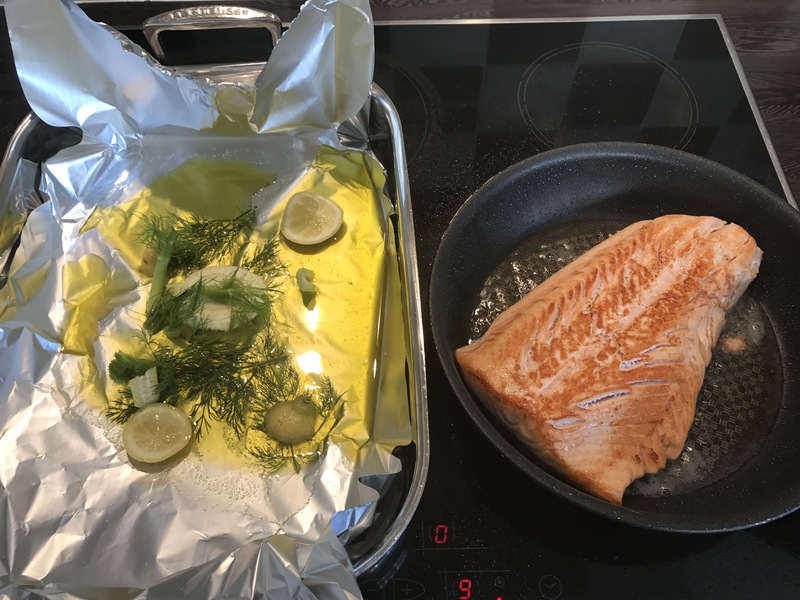 I got the oven pan ready with foil ready prepared with a bed of olive oil, the fronds from the fennel bulb, some fresh dill from the garden and slices of lemon. You are not going to eat these so don’t worry if they are rough looking. 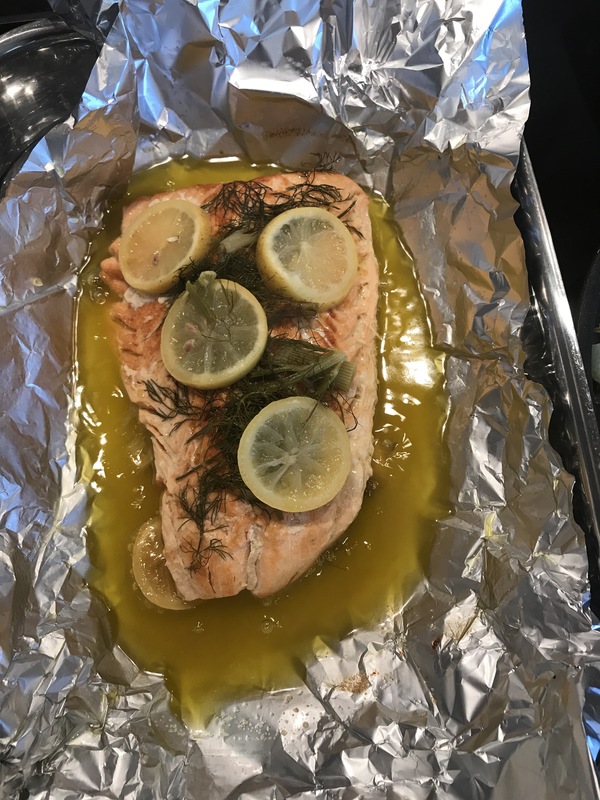 When the salmon has a good colour lift it into the pan leaving the coconut oil behind and put the same lemon and herb on top. 10 minutes have gone so far. 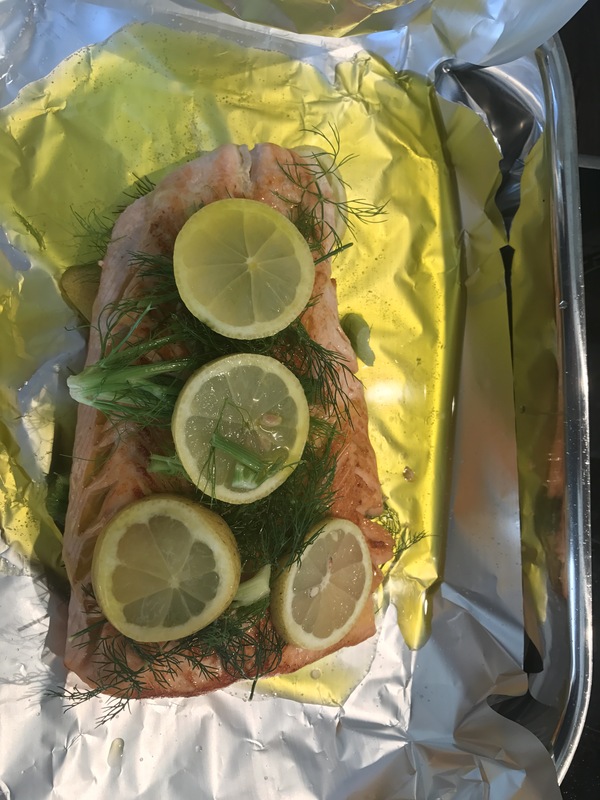 Parcel up the salmon in the foil and place in a reasonably hot oven. While the fish is cooking wash your salad and dry it – that takes no more than 10 minutes tops. 15 minutes left until 8pm! Wash your fennel bulb and thinly slice and saute in the coconut oil left in the pans from searing the salmon. That’s going to take almost all the remaining 15 minutes for a single fennel bulb. When the fennel is soft and lightly brown it’s ready. Take the salmon from the oven and carefully unwrap – watch out for scalding hot steam! 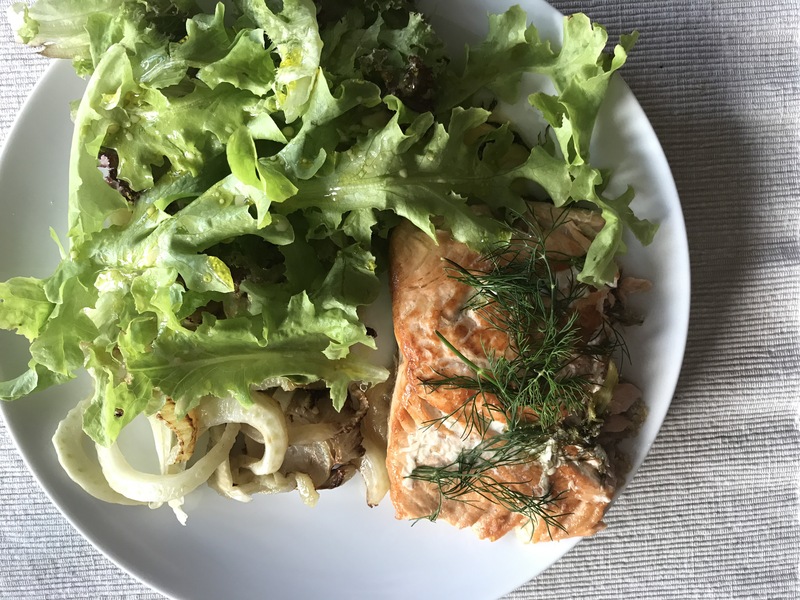 It’s 8pm the fish and fennel are perfectly cooked, the salad is waiting, all you have to do is put it on a plate, add some Celtic salt if you want and eat it.